The quest for karma continues, with yet another set of yoga classes. I snuck into the back of a heaving local class popular for using scented oils. All great, until someone fired up a sausage BBQ behind us. Yoga is always at the top of my list of after work exercise classes. After all, I did have about 12 years of relentless sun salutations under my belt. Back in Calcutta, my mother signed us up to the local yoga centre. A stern lady resembling the love child of Indira Gandhi and Maggie Thatcher (God rest their souls) would give us home lessons. All I remember are the gruelling stretches and her rising blood pressure as we pleaded through every extra count for mercy. On arriving in London, I discovered I was very much on trend. Years of yoga had already set me on the path to spiritual enlightenment. If I could do ujjayi breathing, I could pretty much do anything. Technically. Prana yoga: Not entirely sure, but I think its about meditation and controlled breathing. I did neither when I went thanks to the pounding house music straining through the exercise room’s double doors. Bikram yoga: This is what happens when you do yoga in the heat of summer, during a Calcutta power cut. The brainchild of a Bengali. No surprise there. Pregnancy yoga: Yoga to lull you into a false sense of security. It will hurt. Sorry. Of course, I am no stranger to taking something old and giving it a new spin. Like this mid-week quick Kofta Curry. I bought a pack of quality ready meatballs, sizzled up a curry sauce and let the meatballs simmer gently in them until they cooked. Not exactly the stuff from the courts of Mughal India but it tastes brilliant and is easy enough to knock up after a busy day. Soak the Kasoori methi in warm water, take the yoghurt out of the fridge and chop the onion roughly. Bring the oil to heat on high in a wide and deep pan. When it sizzle around a wooden spoon, toss in the whole spices and the onions. Saute for five minutes until the onions are translucent, then peel and grate the garlic and ginger directly into the pan. Saute this for another five minutes. Next, mix in the coriander powder and chop the tomato and mix it in. If using tinned tomatoes, just drop two tomatoes into the pan and stab with the wooden spoon until disintegrated. Cook this masala well for 5 minutes stirring regularly to prevent the mixture from sticking to the bottom of the pan. If it does, mix in a little warm water and scrape off the bottom. Then, lower the heat to a simmer and stir in the yoghurt. Don’t worry too much if it splits. Let the masala simmer for five minutes until oil starts oozing out of the pores. When this happens, fish out the whole spices and whizz some of the masala with a hand blender to get a smoother, curry house style finish. Now drop in the meatballs and cook for five minutes on either side with the lid on until cooked through. Stir through with the garam masala, sprinkle the kasoori methi and its water, and add salt to taste. 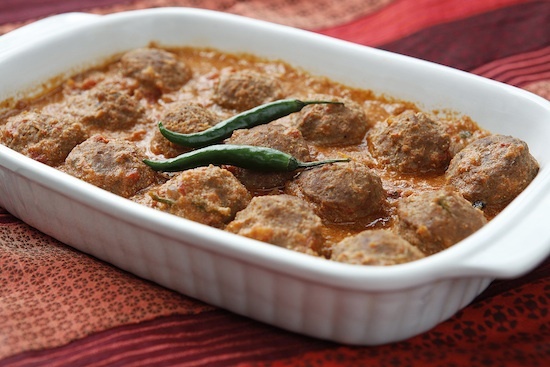 Serve this quick kofta curry with warm ready bought rotis and sliced cucumbers drenched in lemon juice and salt. 12 years of Sun Salutations must last you through the entire lifetime of good health and glossy skin! Not frying the meatballs? They wouldn’t break? Ha! I had 12 meatballs in the fridge… leftover ones from a batch made by me earlier and was wondering what to do with these. Cannot have spaghetti and meatballs twice in one week! Made this today and it is faulous. The Kasuri methi just completes it perfectly. Thank u! Ha ha ha, nice interpretations and explanations! Nice photo of you too! Hahaha , the pre-natal yoga bit made me crack up . You are incredibly funny. Hi m, my mum did something with a box of on-the-brink-of-going-bad falafel that she liberated from my fridge! Ofourse pinning her down for the recipe is impossible and I’ve got a pack of Angus meatballs that I’m going to try this with-thanks!!! Something similar I mean-god these toddler filled sleepless nights are driving me crazy!! Hope you’re coping with your two ok! Thank you for this recipe. Very yummy and tasty. Exactly my kind of meal!